Friends, it’s here! 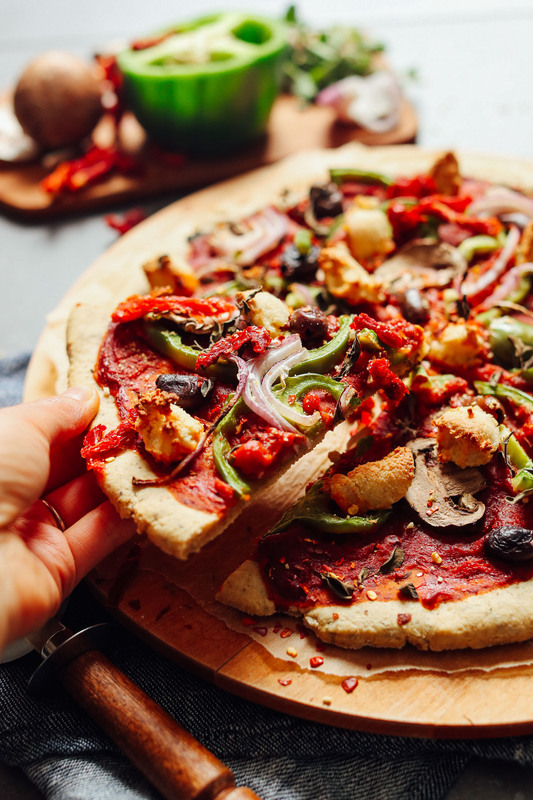 A vegan, gluten-free pizza crust that’s easy to make with ingredients you probably have on hand right now. Not to mention, it’s perfectly crisp on the edges and firm but tender in the center. Whoop! 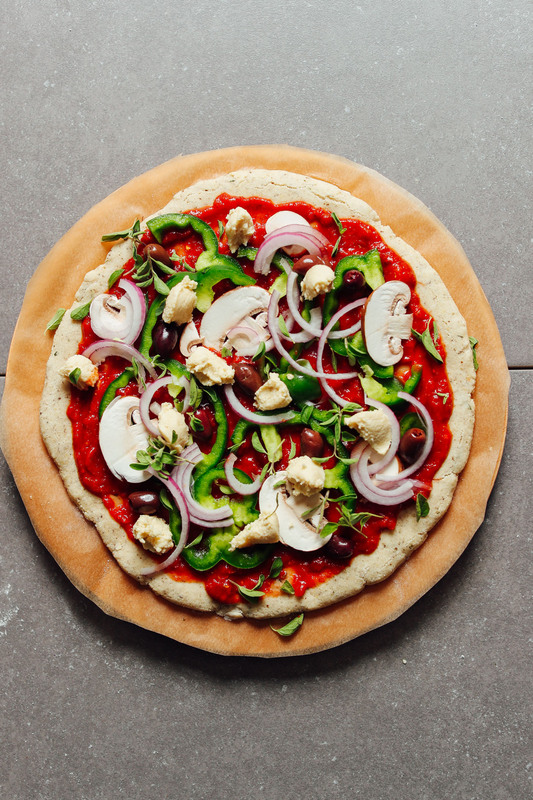 Let’s make gluten-free pizza dreams come true! This recipe requires 10 simple ingredients and comes together in less than 45 minutes from start to finish! The base flours are comprised of almond flour, potato starch, and arrowroot starch. Potato and arrowroot starch are particularly great for this recipe because they help make a firm and crispy-on-the-edges crust that’s also tender in the center. No gooey center, no cardboard edges – just pure, airy, delicious goodness. We also included some flaxseed for binding (and fiber), olive oil for moisture (which you can sub for water if oil-free), oregano and garlic for added flavor, and vinegar and baking soda to help the crust rise a bit. Having tried a lot of gluten-free crusts (our own, at restaurants, and box mixes), we can confidently say this is the best gluten-free pizza crust we’ve tried and SPOT-ON in flavor and texture. Swoon! Once your crust is formed, bake for 10 minutes. Then top with desired toppings. We went for tomato sauce, peppers, onions, mushrooms, kalamata olives, oregano, and whipped almond ricotta cheese. But you could go any way you prefer. I could see pesto working well here, as well as my butternut squash sauce! Just a few more minutes in the oven and it’s officially pizza night! For those of you in the vegan gluten-free camp, this is thee pizza crust for you. We couldn’t believe how fluffy, crispy, and tender it was all at the same time. Plus, not only is it delicious hot out of the oven, it’s also tasty as leftovers the next day – cold or hot! 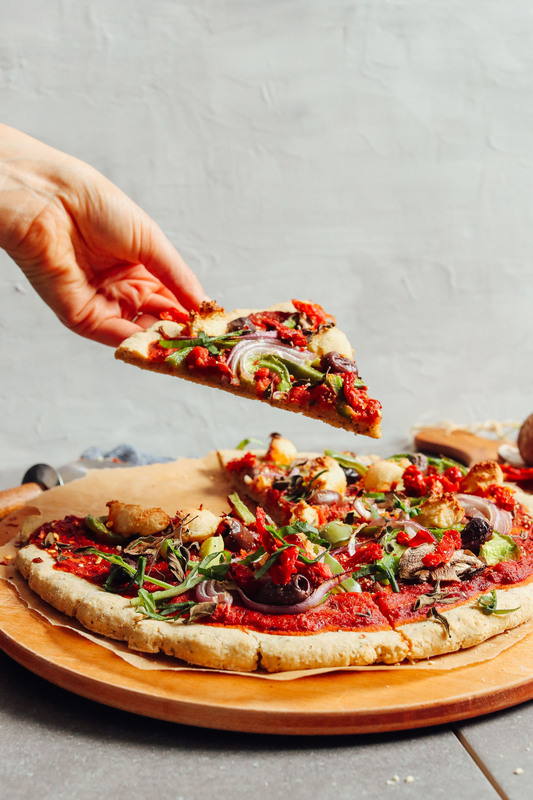 If you’re into pizza, also be sure to check out our Mini Portobello Pizzas, Butternut Squash Veggie Pizza, Favorite Vegan Pizza, Cauliflower Pizza Crust, and our original Best Gluten-Free Pizza Crust. An easy-to-make gluten-free pizza crust that's perfectly crisp on the edges and tender in the center. Just 10 ingredients required, easy methods, and so delicious! 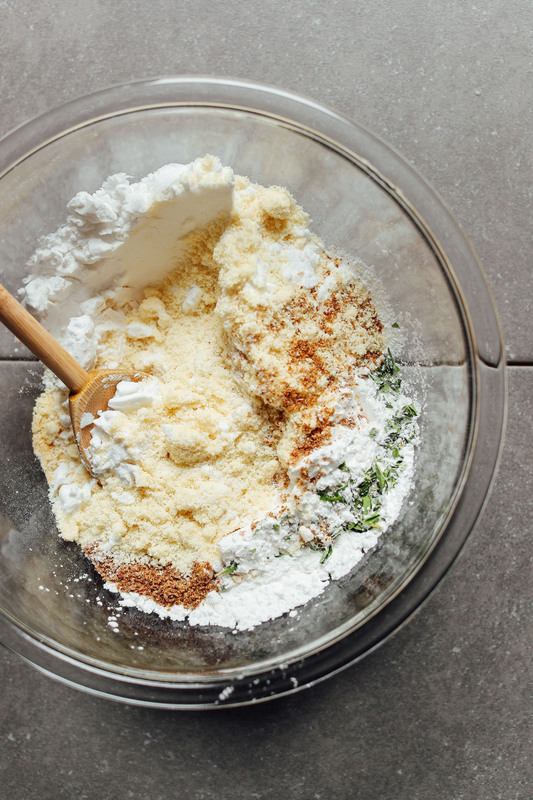 To a medium mixing bowl, add the almond flour, potato starch, arrowroot starch, flaxseed meal, baking soda, oregano, garlic powder, and sea salt and whisk thoroughly to combine. In a separate small mixing bowl, combine the vinegar, olive oil, and water. Whisk to combine. Add the wet ingredients to the dry ingredients and stir to combine until a dough forms (see photo). If it's too crumbly, add water until a moldable dough forms. If too wet, add more almond flour. 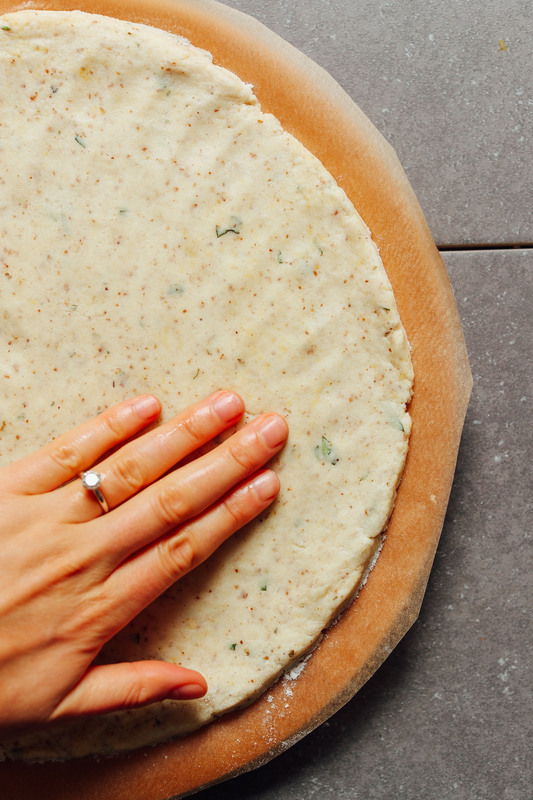 Transfer the dough to the parchment-lined pan or pizza stone and use your hands (or a floured rolling pin) to flatten and shape into a circle or square (the shape of your pan). It should be about 1/4-inch thick or less. It will puff up a little when baking. If the dough sticks to your hands, lightly oil to prevent sticking. Transfer the crust to the oven by sliding the crust on the parchment paper onto a middle oven rack and bake for 10 minutes. Remove the crust with the parchment paper and set it back on the pan or pizza stone. Top with desired sauce and toppings. We went for puréed tomatoes, onion, peppers, oregano, almond ricotta cheese, and kalamata olives (and added sun-dried tomatoes and fresh basil after baking). Bake for another 15-20 minutes or until the toppings are toasted and the crust is very slightly golden brown and firm to the touch. Enjoy hot! Store leftovers covered in the refrigerator up to 3 days. Enjoy cold, or reheat in a 375-degree oven (190 C) until hot. To freeze: I would recommend par-baking the crust (completing the initial bake), then freezing on a baking sheet and storing in the freezer up to 6 weeks. Then, bake as instructed, adding a little extra cooking time if baked from frozen. *Nutrition information is a rough estimate for 1 slice of 6 slices (as the recipe is written), crust only without toppings calculated with the oil. Don’t know if this is a silly question but does this base taste of almond meal/flour?! I’m really not a fan of that taste but was wondering if the other ingredients mask it? Yes, the other ingredients mask it well! Thanks, I actually just had this for dinner and it was yummy!! A bit soft though, almost like it was a bit undercooked even though we left it in the oven for 5-10 minutes longer than stated. Is this to be expected? Hi! I really have been on a pizza kick lately so want to make my own to be healthier. Can I sub the almond flour completely with garbanzo flour? I like to reserve my almonds for desserts and granola and this swap is more cost effective for me. I know there is a pizza recipe here with mostly garbanzo flour, but I really like the sturdiness and heartiness of this pizza. I’m trying to figure out a way to combine them because I want a pizza with toppings such as these. Unless you think the Socca Pizza recipe is sturdy enough on its own? I wanna sauce it rather than dollop (like shown in the video). It just looked a tad tender and delicate for what I’m currently seeking so I think the starches here would help. Hi! We haven’t tried using garbanzo flour for this recipe but we do have a socca bread recipe which uses it. If you experiment with this recipe, report back on how it goes! Hi! Just curious if you think this pizza crust would cook ok (and not get overcooked) in a mini pizza oven? The temperature goes up to about 500+ degrees, I think. Thanks in advance! Hmm we haven’t tried and can’t say for sure.. if you give it a try, report back on how it goes. Good luck, Emily! This is such a good recipe. I followed the recipe exactly as written. My house smelled like a pizzeria while it was baking. The flavor was delicious. Some of the crust was a little mushy in the middle so I will bake the next one a little longer. I made this as written and it was amazing! Crispy but not crumbly. Held up to sauce and topping well. The best gluten free dairy free crust recipe I’ve tried. Whoop! Glad to hear it, Stephanie! OK this crust is amazing. It really is crisp on the outside and soft on the inside and DOES hold a lot of toppings. It tastes so good my family was seriously wowed! And honestly, it really was so fast to make I was shocked. Like a couple minutes. I’m really blown away. I swear every recipe on this site is like formulated to perfection! Thank you so much! I LOVE this recipe! Thank you so much. It is our regular once a week dinner with changing toppings. Last experiment was a fall fiesta with white bean garlicky paste, butternut squash, mushrooms and caramelized onions. I keep the crust longer in the ovens and it becomes really crisp. Amazing! We are so glad you enjoy this recipe, Daniela! Wow! Thank you so much for this recipe. Absolutely amazing crust. I have IBS and follow the low FODMAP diet, so I’ve been looking for a recipe that would work well for my sensitive and cranky tummy! I omitted the garlic powder (cannot digest garlic in any form) and used truffle-infused olive oil for some extra flavor! Also ran out of arrowroot partway through so I used some tapioca starch as well. I topped with homemade tomato sauce and Tofutti Ricotta. So so delicious and look forward to eating this as leftovers tomorrow! Would you substitute with equal parts tapioca starch? White rice flour, brown rice flour, corn starch? If almonds were cheaper, I’d make this every other day!! I put Kite Hill vegan ricotta, sauteed spinach and mushrooms, and olives on the pizza and it was deeeelicious. My omnivore roommate ate a lot, he LOVED it too! Yum! That is a solid topping lineup, Antonia! Made this for dinner last night! So yummy! Doubled up the recipe so I didn’t have to share lmao Just make sure to roll thin bc will puff up! Yay! Glad you enjoyed it, Dorothy! Best. Crust. Ever!! Super easy to make & came out perfect. Such a good base for any toppings! I used it for a Thai pizza so subbed out the oregano for cilantro. Thanks! I substituted GF oat flour for the potato starch because I didn’t have any. I wouldn’t say it tasted like your traditional pizza crust (probably would be more traditional-tasting/fluffy with the potato starch, though), but I LOVE IT SO MUCH. I am pregnant and also allergic to everything and this is all I want to eat all day long. I’ve made it twice in the last five days. It’s nutty and yummy and I love it. Topped with roasted eggplant, sauteed onions/green peppers/mushroom, and a roasted red pepper sauce because I’m allergic to tomatoes. Thanks for existing, Dana! Wow it really is the best gluten free crust me and my husband have tried! This is the second time I’m making this and it’s honestly so easy and so tasty! It gets a bit pricy but it’s a lot more worth it than just a daya pizza or something like that. This sounds amazing! Would arrowroot starch work as a substitute for the potato starch in this recipe? We need to stay Paleo. Thanks! I think so, but I’m not sure. Let us know if you give that a try. This is my question too – think I will try 1/4 c cassava flour and 1/4 cup arrowroot flour for the 1/2 cup potato starch? Will report back re: findings probably next week! Sooo yummy! The crust is fantastic, so glad my husband doesn’t eat carbs, I get this all to myself. We are glad you enjoyed it, Megan! I freaking love this recipe, man. I’ve made it several times, and the crust is absolutely perfect – crispy yet tender, and flavorful. Stands up to any toppings i toss st it. And who doesn’t love pizza?? I’ve discovered a crust-spreading timesaver: Instead of dumping the lump of dough in the center of the parchment paper, I spoon it out, sort of as if I am making drop cookies. Then just connect the “cookies” to make a crust. Viola! This was yummy! I used a kale pesto sauce instead of pizza sauce. Will be making again! I made this last night. I loved it. Super fast and easy. I have made other gluten free, vegan crusts and this is so far the best. The popular cauliflower crust takes forever and other versions require too much advance prep. I substituted additional potato starch for the arrowroot starch and used coconut oil instead of olive. I also omitted the vinegar as I don’t use it. It worked. This time I hand pressed it to 1/4inch thickness. I got a good size, 2-person pie. crust and will really give a super thin crispy pizza feel. Thank you for this Godsend!!! Now I won’t dread pizza night! I have been making this crust about every other week (I know…!) since it was posted a few months ago. I love it’s simplicity – it reminds me of the simple mills gf crust in terms of ingredients and texture. However, it hurts my stomach quite a bit. There aren’t many filler flours in this crust in comparison to many other gf crusts I’ve tried. I knew it was the flax seed so I eliminated it and the texture of the crust really goes down hill and leftovers are basically cardboard. But! I substituted an EGG for the flax and it totally changed the texture of the crust and it’s great. Not to mention leftovers really hold up. The texture takes on a more doughy texture. I realize not everyone can eat egg or chooses not to, but if you can/want to and flax hurts your stomach, too, try adding 1 egg instead of flax (keep everything else the same). Game changer. This is awesome thank you so much. I used tapioca starch in place of potato because I couldn’t find that at my store. I used equal amounts and it turned out great!! I think I like this more than the simple mills box mix and I would imagine this would have to be cheaper!! So yummy!! Thanks for sharing your recipe sub, Amanda! We are glad you enjoyed it! It was very good, but the crust was soooo dense and rich! We made a second pizza after seeing how much the first one made, and we wished we’d just stuck to one because honestly, after 1 or 2 pieces, we were totally full. Like it, absolutely. But not sure if I would make it again. THANK YOU SO MUCH, DANA! I’d given up, but after 6 years of being gluten and dairy free, you have given me a pizza that is easy and delicious and not overprocessed. The almond whipped ricotta (I made a half recipe) is perfection on this. I made your recipe without modifications a couple weeks ago. But I was craving it again this past week and didn’t have arrowroot on hand, so I tried tapioca as suggested as a possible sub previously. It came out great! I’ll still stick to arrowroot when I have it but I wanted to comment to let others know that tapioca worked for me. Also! The whole pizza is 4 servings for me, so second time ’round I made 2 smaller pizzas. One crust, I parbaked and froze. The other, I cooked up and had half hot and half the next day cold. It was great all the ways. This is a fabulous (& forgiving) recipe!!! My daughter inadvertently quadrupled the quantities so we had enough for dinner, leftovers & a par-baked crust to freeze. Yay! I baked crusts on parchment on a preheated pizza stone and the suggested times worked perfectly. Thank you so much! This is the best gluten free pizza crust ever! 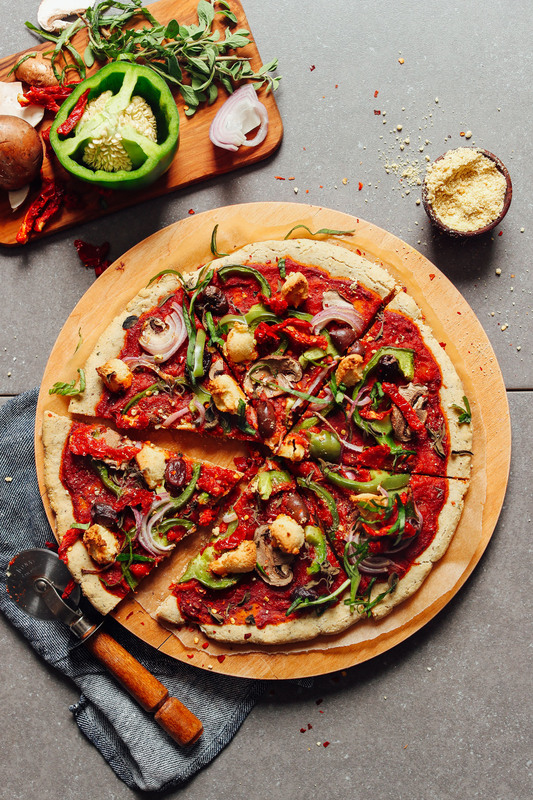 Between this recipe and your cauliflower crust recipe, all of my pizza needs have been met. Yay! We’re so glad to hear this! I made this for dinner tonight and it was amazing! I didn’t bake it straight on the rack but rather on a pan with a silicone mat and it still came out crispy! The dough itself smells so good and is so easy to put together. My picky boyfriend said he liked it better than dominos, so it’s a big win in my book! I am allergic to flax. What could I replace with or should I just leave it out? I’d say omit or sub chia seed. Is there a substitute for the potato starch? I made this dough almost exactly as stated and it turned out great. I will admit that I may have left the dough a littler thicker than 1/4 an inch but not by much and I broiled on high for the last 4 minutes. I also ran out of parchment paper so I cooked it on a sheet pan. This dough is rich and will definitely fill you up. It’s tasty, crisp on the edges and tender on the inside. I put store bought marinara on top with onions, peppers, kalmata olives and mushrooms. I topped with salt, evoo and yeast seasoning. My dad (who eats only junk food) and my husband (not gluten free) loved this and so did I! Will definitely make again; it was so easy! Thanks for this! Yay! We’re glad everyone enjoyed it, Sam! Just wondering if you’ve ever used the BBQ for the pizza cooking part, after the initial parbake. Thinking about making a few for the freezer and love too BBQ pizza when the weather allows. We haven’t, but if you give it a try, report back! 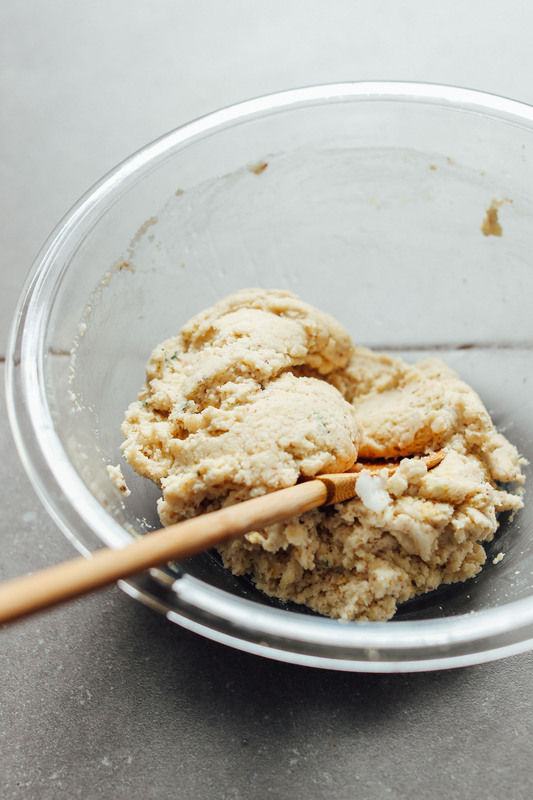 Cashew flour works amazingly well in this recipe as a sub for almonds. Love the combo of flavors here. You guys never let me down. Thanks Dana! This crust was amazing when I made it today! This is by far the best gluten free pizza crust I’ve had! The fact that it is vegan makes it even more impressive! My skill with dough is pretty lacking but I was even able to get a pretty close to perfect result the first time. My dough was very sticky, so it sounds like oiling it would be helpful. Thank you so much for this (and all the other) amazing recipe! I’ve been making the same vegan GF pizza crust for years but decided to try this because it looked easy and because I’ve had success with so many recipes on this site. After the initial bake I knew I could never pass this off as pizza crust to my kids, so chose not to make it into a pizza. It’s more of a nutty, crumbly, biscuit-y flatbread. Tastes okay but not like traditional pizza crust at all. Will enjoy it as bread to accompany soup. What is your pizza crust recipe? For the most part I liked this. It turned out perfectly crispy. I had to use one cup corn starch and a little bit of cornmeal. My husband said it was too nutty and overpowering though. I think with a better pizza sauce and toppings like sundried tomatoes it would have matched better than what I used (spinach and mushrooms). This was delicious! I loved the crust, Crispy on the outside and chewy on the inside. Great recipe, thank you so much! Do you think we could sub tapioca flour for the potato starch? Julie, I did not have any potato flour on hand so I subbed 1/4 C of cassava flour and 1/4 C of organic cornstarch in place of the 1/2 C potato flour and it worked beautifully. Good luck! Oh, thanks for sharing, Janelle! I tried your recommendation of 1/4 c cornstarch and 1/4 c tapioca flour to replace the potato starch and it worked wonderfully! Potato starch is not something I keep around the pantry, but the others are! The crust was awesome! Crisp on the outside and soft inside, with great flavor! I will definitely be making this again! Glad it worked out, Amy! Thanks for the recipe. But in ingredients, you say “almond flour not almond meal”. What’s the difference? Almond flour is made from blanched almonds with the skin removed. Almond meal is made from whole raw ground almonds. The almond flour yields a fluffier texture and more delicate flavor. Can tapioca starch be subbed for the potato starch? Hmm, I think so. But if you try it, let us know how it goes! I read an article from Carrie Vitt that putting flax seeds in any baking causes the oils to oxidize, which is very bad for you is this true? I don’t have an opinion on that. But do what you feel is best for you! Do you think it’s possible to double the potato starch and eliminate the arrowroot? Thank you for this crust recipe, I’m so excited to make it! Can you bake the crust on a pan with parchment paper? Or does it need to be on parchment paper only? Both work, I just like baking on parchment paper in the oven for extra crispiness. Thanks Dana! I love crispy also and will try it. This looks amazing! Any ideas for substitutes for the flaxseed meal? I have a hard time digesting it so would need to swap it out. I have a bunch of almond pulp leftovers from making almond milk. Can I use leftover almond pulp instead of almond flour? Thanks so much! That should work – let us know how it goes! Is arrowroot powder the same as arrowroot starch? Can I substitute it with tapioca flour? Can I substitute instant tapioca or tapioca starch/flour for the Arrowroot? I’m allergic to it and corn starch. I am also allergic to almonds, and was planning on using a GF flour blend (Bob’s Red Mill). Am assuming I’d forgo the potato and arrowroot starches? Or do they provide something a GF flour does not? Thank you! I would still include them. I’m not sure how well the GF blend will work here. But if you try it, let us know how it goes! Made this yesterday and it worked nicely – it felt almost like a yeasted dough. I used oat flour in place of almond; potato flour in place of starch; and tapioca flour in place of arrowroot starch. (I already had the potato and tapioca flours on hand.) It took 16 or 17 tbsp of water, but I think different flours are more thirsty than others. Great, thanks for sharing, Hilary! Just to clarify: the second time back in the oven with its toppings, the pizza is on a pan and not directly on the rack? Have you tried freezing this and if so does it work? I like to make-ahead batches of pizza dough and put in the freezer for quick mid-week meals. I think that would work! I would probably recommend par-baking it (doing the initial bake), and then freezing on a baking sheet and storing that way. Then bake as instructed, adding a little extra cooking time if baked from frozen. If you buy blanched slivered almonds, I think you could totally make your own almond flour! I make my own hazelnut flour by blending the raw nuts in the blender till they are fine and then perhaps put them through a sieve but i do not mind them a bit grainy. Just use small amounts so the pieces fly around right on top speed. That is my experience also with cashews and other nuts. Grinding almonds will make almond butter. I learned this the hard way when I nearly ruined my grain mill. (I’d dried the almonds also.) Didn’t work. Just got embarrassed.? Maybe it wouldn’t be as fine in the Vitamix as my mistake with the grain mill-I’d be interested if it works. I think there is too much moisture though. I make my own almond flour by first making almond milk. Soak a half cup of raw almonds overnight and slip off the skins. I use the tall unit of a Nutribullet to grind the soaked almonds with purified water up to the max fill line then strain out the pulp with a nut milk bag. Crumble out the remaining pulp after squeezing out the milk onto a dehydrator fruit roll sheet and dehydrate till dry. Then grind to a fine flour in the small unit of the Nutribullet et volia almond flour! Smart! Thanks for sharing, Jane! I use the vita mix with the ssd’s special grain/nut mill blender you can order from them. It works awesome. You can also do with the standard blender just do short pulses repeatedly, allowing the notes to settle in between pulses, and dont over do it. There’s a fine line between flour and nut butter. I think so! Brown rice would be better. I make one similar with garbanzo bean flour and tapioca flour. Those would work I’m sure. I’m also gluten free. What is your recipe? I would love to try it! Looks amazing!! I really want to try this out, but I am allergic to almonds do think cashee flour would work? I do! Let us know how it goes.